The leafy suburbs of south-west London provide the perfect place to house the perfect pottery class. These studios have high ceilings, good lighting and the South West London hospitality. 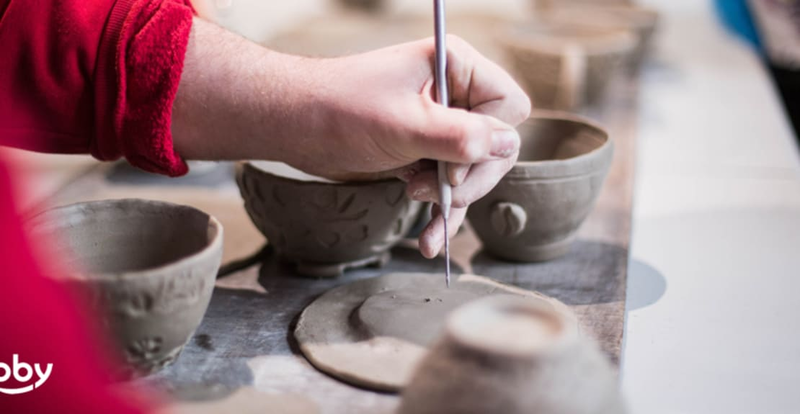 Accessible, affordable and extremely worthy of your time pottery classes, we've picked out the best places in south-west London to get into wheel throwing or hand building and start creating your own collection of less than perfect pots. Go Create is a huge art studio in Wimbledon, that holds a range of pottery classes taught by various big names on campus (in the pottery scene that is.) The Great Pottery Throwdown contestants Nam Tram and Clover Lee both teach classes at Go Create, so whether you fancy learning wheel throwing, (think, the movie, Ghost) or you want to stick to hand-building ceramics, this gorgeous airy studio in Wimbledon is the perfect place for you to start your pottery journey. Start your pottery journey with Clover Lee and Emilia. In the beautiful creative studios, ACAVA in South Wimbledon, Clover and Emilia run a 6-week Monday evening wheel pottery throwing class. These classes are intimate, with two teachers so you get plenty of one on one time. Both girls are incredibly qualified. Clover Lee was even a finalist in BBC reality drama The Great Pottery Throwdown in 2017. Emilia trained as a ceramicist at the Australian National University (Canberra School of Art). Since graduating in 2002 she has practised, exhibited and taught ceramics in Australia, the USA and for the last five years, at the Glasgow Ceramics Studio in Scotland. These brilliant and bubbly girls are very talented in their field and more than happy passing on their skills to other people. Their evening classes are fun and informal without an air of pretension, but if you want to learn from the best, this class is the one for you! Tucked away in an industrial site, this beautiful pottery studio is huge and one of our favourite of London’s best kept secrets. During the day, Workshop 305 works as a community centre for adults and children with physical or learning disabilities, but in an evening, the studio transforms into a pottery paradise. The studio is enormous with everything you would ever possibly need. There’s a wheel turning station, a hand building station as well as a slab pottery table. The studio has its own kiln and also runs special glazing workshops for if you want to take your pottery to the next step and really immerse yourself in the skill. Several different teachers work at the studio, they are all independent artists who, when they are not volunteering their time at Workshop 305, are creating in their own studios and selling their work as ceramicists. The atmosphere at Workshop 305 is very family orientated and has a really welcoming feel to it. We love it here.